I am very proud to introduce myself to you as Ron McLellan’s son. On behalf of my entire family, I want to thank you for being here today to celebrate the life and legacy of my Dad. Ron McLellan was born and grew up in small town outside of Cleveland called Chagrin Falls. You can still go to the quaint downtown and get an ice cream at the same place my dad bought one for a nickel. He loved animals his whole life and would often tell stories of his childhood dog, Rowdy the Saint Bernard or his beloved lab Heather. One of his happiest places was on the back of a horse. He loved to ride and secretly wished he had been born a cowboy. Because of that love for animals, he grew up wanting to be a veterinarian, but he also grew up in poverty and couldn’t afford the schooling. Fortunately, he was brilliant at math, so he got his degree in accounting and became a CPA. 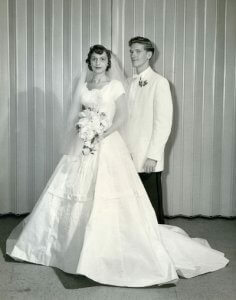 He married our mom while they were still in college and they were together for 27 years. Over the course of his career, he worked in Cleveland, Caracas, Minneapolis, and Denver in a variety of leadership roles in large banks, he was named in Who’s Who in America and was successful enough that he could retire in his 50s. By then he was able to fulfill his dream of moving to FL. To be out of winter and near the ocean. His life here in retirement was filled with many dear friends, owning another boat and a motorcycle, working with an equestrian therapy program and spending a lot of time with his kids and grandkids. Those are the facts. But they are hardly the sum of the man. I’d like to take a few moments to actually tell you about my Dad. About his heart and his hopes and his legacy. My dad was a man who believed in forever. He believed in eternity. That showed up in a variety of ways. 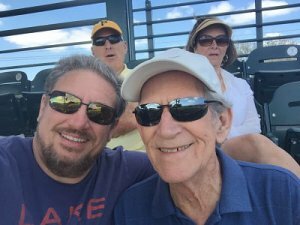 Until he got sick earlier this year, every month, he used an adding machine that he bought when he was in college to pay bills and track the budget. My sister and I were laughing the other day – we both remember hearing the distinct noise of his pulling that lever from his office. 60 years later – it’s going strong. His wallet, even though we’ve all bought him new ones, was probably from when I was a baby. He was Scottish and grew up in poverty, so he believed in squeezing every bit of value out of something. My Dad poured himself into relationships because he also believed that they were forever. If you were in my Dad’s heart, you stayed there. You felt so protected and so surrounded by his love. He made it safe. He lived for his family. He worked in a career he didn’t love because it was a means to an end. He could provide a great life for us. A life very different from his own upbringing. 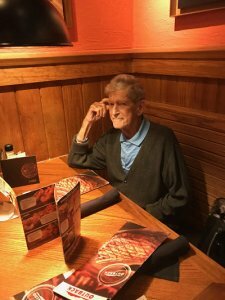 He wore old clothes, so we could have new ones and he was never late or too busy to sit at the dinner table with us, to share the stories of our day and to connect as a family. My Dad put a lot of value in just being together, in just being present. He wasn’t always the most talkative guy but when you were with him, you felt his presence. And often that was enough. I’ve always loved to watch night time thunder storms. When we were kids, our house had a three-season porch. When a storm was loud enough to wake me up, I’d head downstairs to sit on the porch where I could see it, hear it and smell it. Sometimes my Dad would beat me down there and other times, I’d beat him by a few minutes. We’d sit in silence, watching together. I have no idea if he really loved storms too or if he just wanted to be with me. Either way, I loved those quiet nights. There was also a playful, joyful side to him. 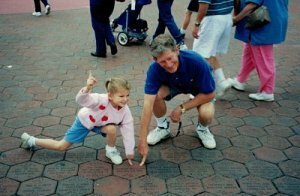 Many people would be very surprised to learn that my dad was a prankster who loved telling jokes and when we were at Disney World, he was the biggest kid there. There was no roller coaster too fast, tall or crazy. Even in the last couple years, he was game to go on them all. But when I think of pure joy on my dad’s face, it was when he was dancing. He loved to dance, and our kitchen was an impromptu dance floor more times than I could count. There was always music playing and next thing I knew, we’d be doing some crazy dance as a family. 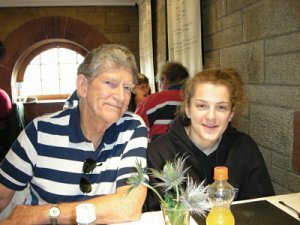 Dad’s commitment to being present meant he was our cheerleader at our school and sporting events and our confidante when life got tough. And that didn’t end when we grew up. I’m 55 and have owned my own business for over 20 years. He was still my confidante and helped me work out many challenges. And while I know he loved Terri and I – he reveled in his grandkids. Terri and her family live in MN and we live in Iowa. But that didn’t keep my Dad from being at their plays, games, or special events. He told me that one of his proudest days was when my daughter Kelsey (his oldest grandchild) walked across the stage to collect her college diploma. And I know he’ll be cheering Jake on this May as he accepts his high school one. And I totally get why he loved that verse so much. It’s how he was as a father too. He led the way. He made sure we were safe, and he was at our side during every battle we faced. He encouraged us to dream and to reach for what seemed to be impossible and we were brave and courageous enough to do it because he believed in us. One of my dad’s loves was being on the water. My sister and I grew up boating on the St. Croix River in Minnesota, but his real love was the ocean. 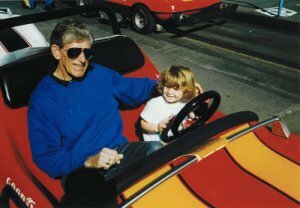 We vacationed on Sanibel Island for years and he and I took many long walks along the shoreline. From that day, that’s how I see the ocean too and it’s why walking along the shoreline is where I could feel his presence the most when we were far apart. I can’t tell you how many times I would send him a picture of my feet in the water and then I would call him, and we’d walk together. A couple days after he died, I went to the beach and walked for hours. I just needed to be with him and so we walked together, and I just let him fill me up with the calm that I needed. His life was about caring for and protecting the people he loved. He taught us how to work hard, dream big and value our good fortune. He also reminded us that sometimes just being present is enough. And when things got a little tough or we were down, he’d turn on some music and invite us to dance. That is my dad’s legacy. But he had one final lesson to teach us. 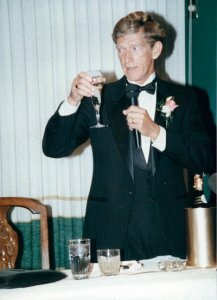 When I think of his final days… they were my dad at his truest form. He was so brave and courageous. He endured so much because he wanted to squeeze a little more value out of life and finally, when his body was too worn to continue, I know he said to himself “be brave and courageous. Because I go before you in every battle” and then he confidently walked out to the calm.